NAMM 2019: Antares has released a simplified version of its iconic Auto-Tune plugin in the shape of Auto-Tune Access. This features the same core features as the full version but comes with a streamlined interface. In fact, we’re told that you can access key Auto-Tune features with a single click. The Retune Speed and Humanize dials each have only three settings, and low-latency performance means that you should be able to use Auto-Tune Access in real-time. The CPU footprint is said to be light, and there’s compatibility with Antares’ new Auto-Key plugin, which can be used to automatically detect musical key and scale and send this information to Auto-Tune. 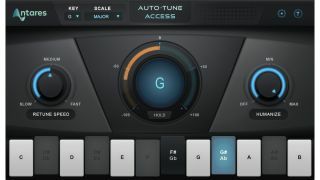 Auto-Tune Access comes in at $99, and is available for PC and Mac in VST/AU/AAX formats. Find out more on the Antares website.